I unearthed my Guerlain Les Gris Eyeshadow Quad from a recent rummage through forgotten drawers and decided to put it to good use. I reimagined one of my all-time favorite pictures on Messy Wands, resulting in the makeup from the recent Dolce & Gabbana lipstick post. Below is the low-down on how to achieve the look. I primed my eyelids using Le Métier de Beauté x Marchesa Sheer Illumination Brightener (at time of writing, still available at John Barrett Salon! ), also applying some to the tops of my cheekbones. I applied the lightest shade from Guerlain Les Gris all over the lid, then patted on the shimmery light gray over three-fourths of the lid. I smoked out the corners with the dark blue-gray shade and added slight definition to the outer-v with the matte gray. I lined my eyes as close as possible to the upper lash line with a black liner and applied a smidgen of the shimmery gray on the lower lash line. Some mascara, and voila. For cheeks, I contoured under the cheekbones with Chanel Notorious and lightly applied blush to the apples with Benefit Dandelion. 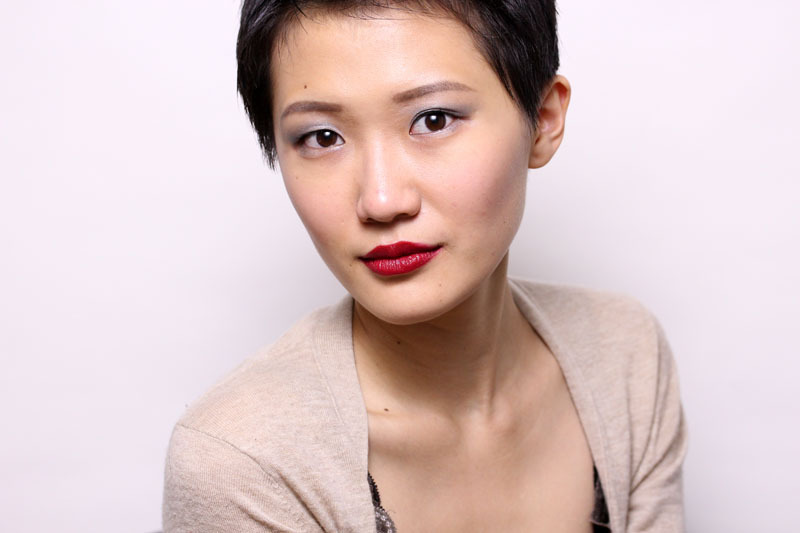 The lips, as mentioned, is Dolce & Gabbana Ultra, lined with Le Métier de Beauté Rose Dualistic Lip Pencil. 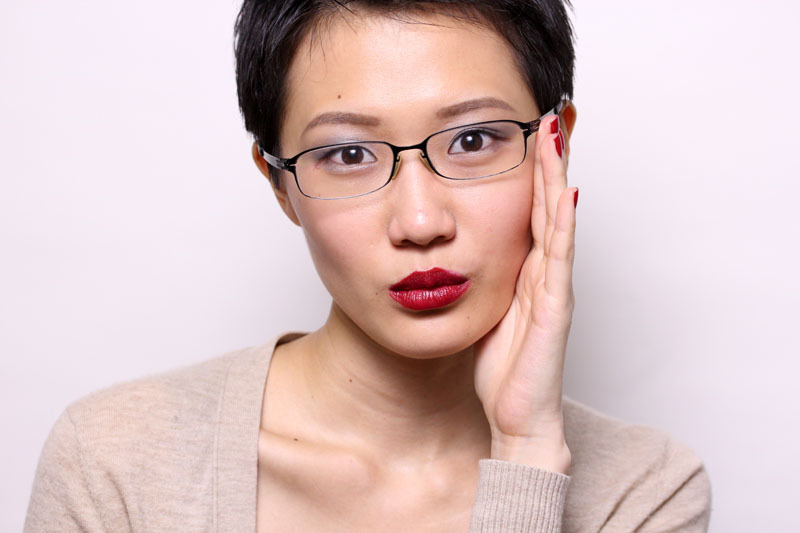 I do not actually think Chanel Dragon Vernis is the best polish to go with this lip color, but I just wanted to illustrate how blue D&G Ultra is as a red lipstick that it makes the very blue Dragon look warm. It's funny how the shorter my hair is, the more makeup I can wear without looking like a total clown. In case the amount of color on your face bothers you though, you could always throw on a pair of glasses. (Feeble hurrah) as this is the only time we of the bespectacled bunch has the upper hand. I'm obsessed with grays lately! You're adorable! 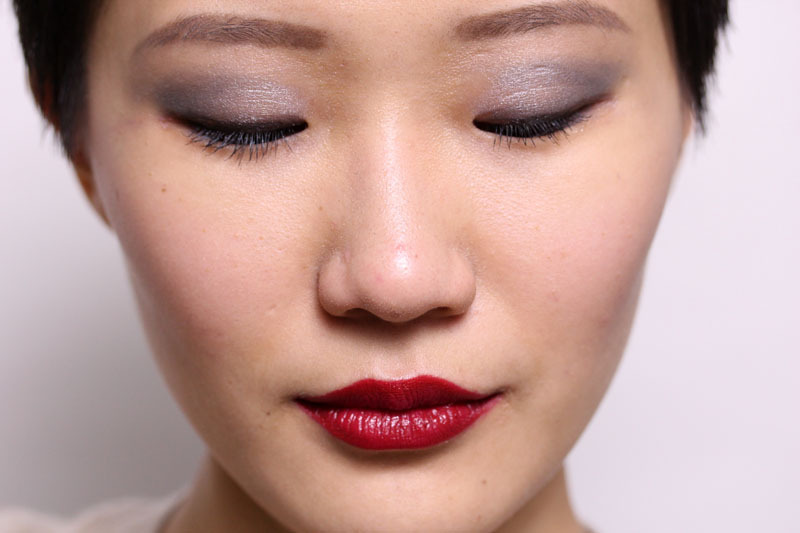 I love the look of silver eyes and red lips for the holidays! I always feel it looks weird paired with my blue eyes but da hell with it, I'll do it anyway! The look is great on you! I totally didn't realize this look would be super appropriate for the holidays. And good for you. I bet it'll look awesome! So pretty! <3 The look in the post you linked is gorgeous as well. The lip color is stunning! 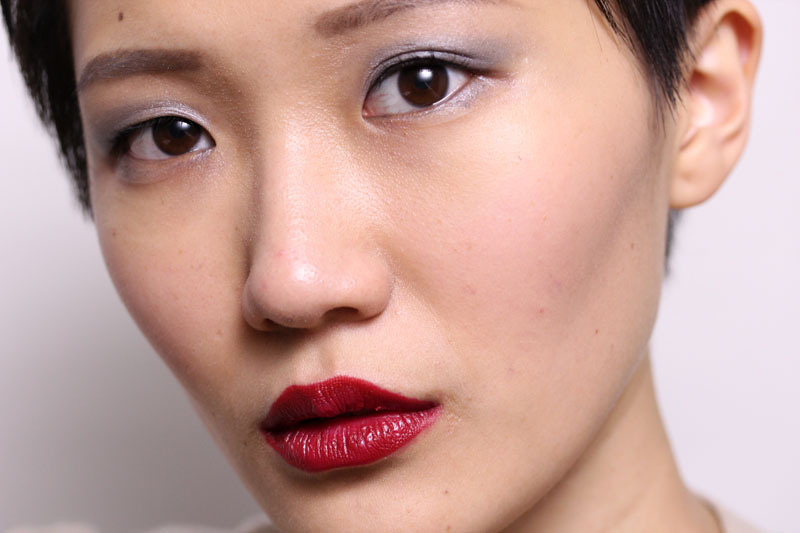 Red lips work so well with your features and style. Something very Xiao. Great job! You are gorgeous!! Your entry looks like an editorial of a magazine! You. Are. So. CUTE. Ahhh I die. That bespectacled shot! I will echo that hurrah, as we the bespectacled really do win on that count. :D I love the ridiculous amount of eye makeup I can get away with wearing because of my glasses! You are TOO cute, Xiao--especially with glasses! :D PS: LOVE your cardi! So pretty! Seriously, why aren't you a model? Such a classic combination - and stunning! And why are you and Arianne making me want to get Benefit Dandelion again??? Eeeeeeeeeeeeeeps. As you know there is no such thing as too many options when it comes to lip color.I like it and you can get more about beauty products.